The heart of yoga can be found in Patanjali's yoga sutras--196 seed verses that describe a pathway for spiritual awakening. 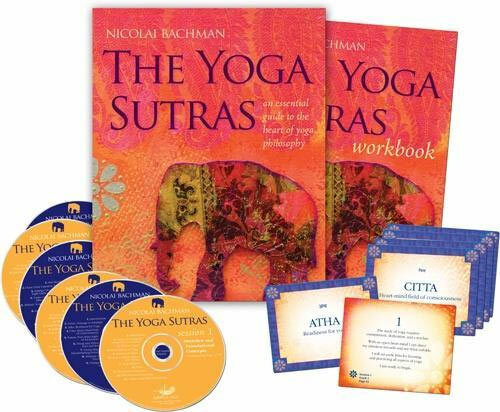 Now with The Yoga Sutras, esteemed scholar and yogi Nicolai Bachman invites listeners to deepen their understanding of yoga through practical exploration of this seminal text. Focusing on 51 key concepts including discernment, self-observation, change, and humility, this complete kit features seven CDs, a 200-page workbook with color illustrations, and 51 meditation cards. From yoga's philosophy and principles to the pronunciation and subtle meanings of each sutra, this treasury of liberating tools and wisdom offers an opportunity to discover yoga's ultimate promise: freedom. We know there’s more to the yogic path than asana, or physical postures, but how do we access the deeper wisdom of yoga philosophy? More than 2,000 years ago, the legendary master Patanjali answered this question in 195 pearls of insight known as The Yoga Sutras. Now Sanskrit and Ayurveda teacher Nicolai Bachman offers The Yoga Sutras, a complete course with a fresh new approach to working with Patanjali’s seminal text for guidance and inspiration on your own journey toward clarity and happiness. Why do we react the way we do in certain situations? How can suffering be an opportunity for growth? Why are nonviolence and truth important to a student? Patanjali’s sutras offer an illuminating perspective on these questions and more. To help integrate this wisdom into our modern life, Bachman offers a unique approach. Instead of reading each sutra sequentially from beginning to end, he focuses on and discusses 51 key concepts. By exploring these principles with him and learning to chant the sutras in Sanskrit, the essence of yoga philosophy is revealed—helping us open to its heart and soul. When you immerse yourself in Patanjali’s sutras, the heart of yoga—and what yoga means for you personally—will unveil itself in new and profound ways. Whether you’re a seasoned teacher or a student looking to go deeper with your practice, this essential course offers a treasury of teachings to help realize the “outer joy and inner happiness” of yoga.